You spend the day enjoying all of what Edisto has to offer with the beach, nature trails, shops, and restaurants. Then you want to kick back and relax for a couple of hours to watch the sun as it slowly sets in the west and casts orange, pink, and red hues over the water as another perfect day at Edisto comes to an end. 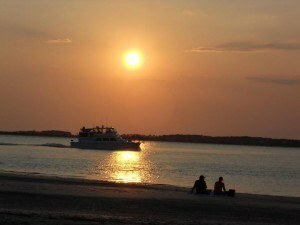 The best way to do this is on one of the sunset cruises offered by Edisto Watersports. Passengers go out on a skiff just before sunset so that there is ample time to explore the waterways and watch the sun as it fades away. Now that it is almost fall, the skiff goes out at about 5:30 pm. It winds its way through Big Bay Creek and surrounding waterways while making several stops along the way so that riders get a chance to learn where they are and how the areas are significant to both Edisto and the lowcountry. After leaving the dock, the captain points out the islands that can be seen in the area off of the coast of Edisto. 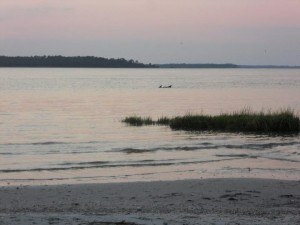 These islands include Hunting Island State Park, Harbor Island, Saint Helena Island, and Otter and Pine Islands. One of the first stops (keep in mind, you do not get off the boat; it simply floats by points of interest so there is ample time for photos and appreciation) is Pine Island. This uninhabited island is maintained by the South Carolina Department of Natural Resources. It offers visitors a chance to look over the white sand beach, dense forest, and see any wildlife that might be resting on the beach or on the limb of one of the many fallen over trees with weather-worn trunks. From there, the tour goes on through Pierre (sometimes called Peter) Creek. The remains of an old plantation can be seen just past the trees of Peters Point. The plantation was once one of the grandest of homes on the island and prospered greatly during the cotton crop days of the 1800s, but the Civil War and later, the boll weevil, were too much for the plantation owners to overcome and the house and land began to fall into disrepair. Just past Peters Point there is Bailey Island, which is a true island in every sense of the word. This island is accessible via bridge if one were traveling by car, but almost every homeowner in the area has a dock so that they can easily leave their homes and cruise the creeks. One of the best parts of the trip is that it offers passengers a chance to take a look at historic Middleton Plantation from the water. The privately owned plantation features the traditional red roof, white siding, and black shuttered look of an old southern home. In addition, the plantations former kitchen, which occupied its own building back in the 1800s, sits off to the side of the house and has since been turned into a guest house. Both buildings offer a glimpse into the islands prosperous past. After Middleton Plantation, the skiff makes its way back to the dock, but there is still much to be seen. The wildlife indigenous to the area always finds a way to fit into the scenic landscape. Dolphins will appear all throughout the trip feeding along the banks of the creeks or splashing in the mouth of Big Bay Creek; sea birds like the herons, ospreys, pelicans, and even the occasional bald eagle will eye the skiff from their perches on a dock; and even the deer that live all over the island might dart out from the trees from time to time. Overall, the trip makes for the perfect blend of entertainment, relaxation, and even a little education. Passengers are free to bring coolers on board and can even work on a six-pack while being ferried through the creeks. The trips are $35 for adults and $15 for kids 10 and under. Call 869-0663 to book your trip. If you haven't enjoyed this cruise, I highly recommend it. It is the perfect end to any day on Edisto Beach. Every season offers it's own rewards - don't miss a fall cruise with the golden colored marsh grass, the occassional migrating ducks, and crisp cool sea breeze. In the summer, it is a chance to relax and catch a breeze after a hot day on the beach while learning about the history of the ACE basin. Awesome!